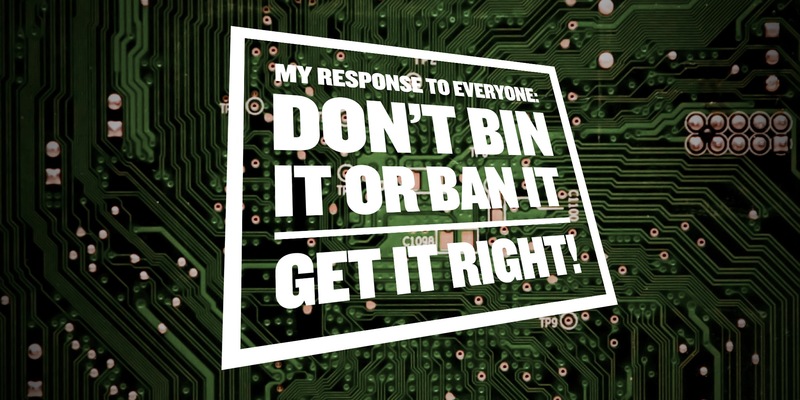 My response to everyone – Don’t bin IT or ban IT, get IT right! I want to be very clear from the outset… Technology can make a big difference. To students’ engagement. To students’ chances. To students’ outcomes. To students’ results. So let’s get IT right! There is no shadow of a doubt that the effects of mobile phones in a student’s pocket are different to those of a school endorsed mobile learning strategy. The two do not sit comfortably on the same scale. Teachers are unwillingly finding themselves in a pro-IT vs anti-IT battle in which the key victims are taxpayers and their children. It goes without saying that whilst this battle continues, education finds itself poised on the edge of a dividing chasm. I’ve been watching with much interest the public ‘debate’ surrounding the use of mobile technology in school. One of the first big public comments picked up by the press was by Tom Bennett where he made a few seemingly throwaway comments about the lack of evidence and efficacy in the use of technology in the classroom. Headlines ensued talking about the banning of mobile phones in the classroom and various Tom-bots following on with their support of this return to 18th century education. To be fair, I don’t envy Tom Bennett. On the one hand he is one of the most revered educational bloggers in the UK; on the other hand he stirs up yet whimsically bemused smiles and/or disbelief from teachers across the land with what appear to be poorly thought out comments. Either way, I have lots of respect for him. Tom goes further in a different post, “Anti-socially mobile? What I really think about classroom tech.” Before I go further, I should point out, this isn’t going to be a blow by blow break down of all of Tom’s points; it’s just that as someone with influence, I’d like to pick up on some of the things he says. Whilst Tom is, as he purports, a ‘behaviour guru’, I’m almost like his DC comic rival but with gadgets however this is my area of expertise, in this regard, with respect, Tom is not. So when Tom says, “smart phones can be extraordinarily distracting for students”, I concur. As can highlighters and Sharpies. I also agree with what he goes on to talk about which is making sure that schools have clear and transparent policies for dealing with the use of mobile technology. Tom goes on with some clearly well grounded and thought out points given his experience and position. He talks about what I consider to be ground zero for schools, advising that, “the default should be, as with any potential distraction in the classroom, not to allow them until careful consideration has taken place of how they impact the learning”. This is good advice for a school looking to use technology who haven’t really considered it before on any kind of scale, either utilising devices on a BYOD basis or other more school-led approach. He then goes on to say; “When using tech in the classroom, consider why tech is being used. Is there a low-tech alternative? Is the tech an important tool or is it merely a novelty. Asking pupils to write a blog for example; fine, but could the aims of the task be met as easily by simply setting an essay?”. Again, good questions and thoughts for schools who are new to this kind of thing. Many educators have moved past this however and many schools too. What is really interesting for me is Tom’s next point. A point which given its place in recent history is really interesting. Unless you’ve been living under a rock, the OECD via Andreas Schleicher released their latest education report in which much media frenzy was paid to the commentary that computers ‘do not improve’ pupil results. I won’t go into too much detail here as others such as Oliver Quinlan have addressed that perfectly eloquently. This is where I start to prickle. It’s not Tom’s fault. And it’s not the fault of the many teachers who choose to not use technology. As mentioned many times previously, it’s a problem of confidence. A problem of competence. A problem of training. A problem of support. A problem where systemic desires and deeply entrenched systems are in place to make profit from education. The thing is, here we are in 2015. A time when according to Doc Brown we should now be on hoverboards. Ok, we aren’t there, but we are in a place and time where we should be able to expect decent learning returns from the enhancements that technology in school can provide for us. I purport that this “good fit” that Bennett talks about is THE thing that needs addressing. It goes right to the very heart of the issues and why we saw in Nesta’s report in 2012, that tech wasn’t making an impact. Much to my dismay, we see it here again in the OECD report in 2015. It comes down to teacher training and ongoing professional development. I’ve mentioned Bennett quite a lot in this article, not just because some of his points needed addressing. For as long as I’ve known him, he has been a champion for behaviour education. For there to be opportunities for trainees to be better trained in dealing with behaviour in schools. For teachers to be better equipped to deal with issues effectively. I believe that the same is absolutely true and more so with the use of technology in education. Is it any small wonder that teachers feel ill equipped to use it if they haven’t had proper training and support? For all the talk of student digital leaders (something I massively advocate as you may well know) where are our adult counterparts? Sadly, adult digital leaders are still thin on the ground in education. Is it really 2015? Eric Sheninger’s seminal ‘Digital Leadership’ book is over a year old now. Many school leaders have been ‘digitally leading’ for some time now but the pockets are too few and far between for us to be seeing impacts in volume. The system is letting us down. Their good practice and innovative approach to using tech in the learning environment is not championed or supported enough to enable their footsteps to be followed by others. They boldly go where others fear to tread and yet they are not celebrated for the advances in education they are making. More than 3,000 Apple Distinguished Educators internationally and many Microsoft and Google Certified Innovators too. But still we are yet to see the impacts. Why? Let’s look at the traditional routes into teaching. BEd for four years comprising of 3 years academic study plus one of pedagogical study. The alternative being a 3 year Bachelor degree and a 1 year Post-Grad PGCE. Both give weight to the PCK (pedagogical content knowledge) model of teaching and learning but what about TPACK? Where is the weighting given to supporting these trainees in their routes into teaching with technology? Is there an assumption that, ‘they’re digital natives so they’ll be ok’ ? There appears to be a clear avoidance to spend money on this type of training, almost in the delusional hope that they will somehow find their way through the digital mists. How long will it be before we accept that this approach isn’t working? Do we have to wait until 3015?! It was so heart-warming to read Associate Professor Steve Wheeler’s post just this last week titled ‘A Future’. In the post Steve talks about some of his most recent graduates from the PGCE at Plymouth University. From their moving stories about the blogs they’ve kept or watching the touching video by Kelly Holborow, on her digital identity, his graduates stand out from the norm. I’ve had the pleasure of meeting some of these graduates whilst on my travels. They are inspirational. For me they hold a light of hope in their hands in relation to the future use of tech in education. These teachers, having worked alongside the likes of both Steve Wheeler, Pete Yeomans and Oliver Quinlan (mentioned earlier) – all three very modern educators in their own right, leave me with the reaffirmed opinion that more focus needs to be placed on the value and importance of technology in teaching and learning in Initial Teacher Education (ITE). Training should instill a sense of adventure and encourage risk taking. It should advocate the use of tech to enhance the learning experience where appropriate. It shouldn’t stop at ITE either. Training should be ongoing throughout all of our careers. As Dylan Wiliam says, “our daily experience as a teacher is a failure. Which makes it the best job in the world. Because you never get any good at it,” therefore then, shouldn’t we get help to get better? Thomas talks a lot of sense. My favourite part of his piece is something that signals directly to points that I always make; when it comes to creating great teaching and learning sequences in the classroom, it’s the teaching and learning which should always come first. Long before you start to think about adding technology to the mix. The key thing I always come back to however which he omits, is that in my experience, for the most part (although not always, and this is a key element of TPACK where you can choose to not use technology if it doesn’t fit) if you do use technology, it can raise expectations, authenticity, agency, engagement and motivation of students, in lots of different ways. It just often links very closely to the skill and confidence levels of the teacher in their happiness in using technology in their classroom and beyond in the digital world. Times are changing. Let’s not be polar about this. Let’s realise that it is actually more likely that the children we work with are going to be using technology themselves in their personal and professional lives. Let’s look at how we can support and enhance their learning using tech whilst skilling ourselves up in the process. I believe that we have the moral imperative upon us to do so. We are after all, leaders of children. Let’s lead them the right way: through inspiring digital leadership, powerful social leadership, responsible digital citizenship. Let’s genuinely model these qualities to the young people we are so privileged to work with. Even in the poster schools for strong IT use such as Gary Spracklen’s ‘IPACA’, Fraser Speirs’ at the ‘Cedars School of Excellence’ or Abdul Chohan’s ‘Essa Academy’ – can these schools say hand on heart that transformational learning with technology is taking place every single lesson? I suspect not. But that’s not the point in every single lesson and I wouldn’t look for that either. The point is that the journey to using technology in ever increasingly responsible ways means a shift in pedagogy, a shift in learning and a shift in how we approach our roles as educators and I’ll go to Essa Academy’s motto, ‘All will succeed’. Let’s start with that and see where we get to.